In a break away from the traditional pyramid structure, Insolence is contructed around the first olfactive spiral. Rather than a slow progression from head to base, the notes spiral and continue to circulate so that your favourite notes remain prominent from flight to finish. The perfume is fronted by actress Hilary Swank, in keeping with Guerlain's stated aim "...to attract women who like Guerlain, but don’t feel ready for it yet, which translates into a younger target..." (via cosmeticnews). I would have thought that aim had already been accomplished with L'Instant (2003, and also by Maurice Roucel), but perhaps the target age here is younger still. Unlike L'Instant, Insolence smells like a Guerlain, in fact, when a friend kindly gave me a sniff before it was released, my first reaction was "Après L’Ondée with nail polish remover". Happily, the roughness of the top notes is short lived, after that, it is, as advertised, red fruits over a still very Après L’Ondée-ish blend of iris and violet, and again as advertised, the red fruits soften but never quite leave the scene, although whether they spiral and circulate, I cannot say. It is not, as one might fear from the tone of the advertising, an unsophisticated fragrance. The base is a lovely, rather dusky blend of vanilla and sandalwood, and once the top notes calm, Insolence is not overly sweet. Simply put, Insolence is a huge improvement over many of this year's attempts to grab a piece of the youth market pie: it does not smell like Jolly Rancher candy or a Bonne Bell Lipsmacker or the like. I'd rather have a bottle of Après L’Ondée, but if I had a bottle of Insolence, I'd certainly wear it. 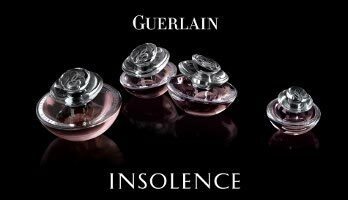 Guerlain Insolence is available at Guerlain counters in department stores now, and will no doubt hit the fragrance discounters eventually. Update: see a review of the matching Insolence Sparkling Shower Gel, or of the new My Insolence by Guerlain. I itch to sniff this, R, but I think it's only just reached the UK and is exclusively at Selfridges. Your review sounds promising; I love violet and vanilla and sandalwood sound pretty much perfect. Apres l'Ondee always turns dry and flat on me minutes into the drydown, but I love those first minutes – if this can keep the sparkly start going, it may be just my thing. I think the “official” UK launch is September 1, but would have thought it had trickled to more stores than 1 by now. Have you asked any stores about testers? They were in quite a few department stores here before the juice went on sale. Not sure if I'd call the dry down sparkling, but will be curious to know what you think of it since you don't like AlO. Insolence is far better than I expected, but still not something I'm moved to buy. “Apres L'Ondee with nail polish remover,” lol! I tested Insolence last week, and I call it L'Heure Bleue, Jr. :):) It's definitely a Guerlain, but I much prefer to wear a classic one. Oh, you liked this one so much more than I did! It wasn't bad on me, just incredibly dull. But then since I don't like berries and am almost always bored by violets, it was quite natural for me not to love Insolence. Yes, I can see the reference to L'Heure Bleue too, but this seems so much less ornate & closer to the clarity of Apres. Either way, it is, as you say, definitely a Guerlain, and that is a good thing even if we'd both rather wear a classic. I was rather afraid it was going to be a horrid Barbie kind of thing. Oh, now this is interesting! I bet I'll like it. Apres l'Ondee makes me feel nearly suicidal (all that sadness,!) but I could probably just make it with this one. And, I totally get the apres l'ondee connection, too, but I smelled the play-doh note that l'heure bleue has on me. See, I'm laughing so hard, I posted twice, lol! I actually liked this one, although I think the bottle is absurd. But it smelled somewhere between Apres and Meteorites to me, and not different enough from either to warrant a purchase. But you're right — it smelled like Guerlain, and hey, you're 80% of a great fragrance right there! L'heure Bleue Junior is a good one, R! I'll have to put it on again and see if I can find the play doh thing, I missed it entirely. L, AlO is very sad, and Insolence not at all so. Wonder if you'll like it though? It is perfectly wearable, but not positive that you will. Robin — PS I smelled the ADP Iris Nobile in an EDP today; I didn't know it came in anything other than EDT, but NM has it. I like the EDT very much, but it is light and fades fast. This one … oh my goodness! It is lovely, full and rich and buttery, very much a comfort scent under the iris. It is missing the sharp citrus opening of the EDT. Anyway, wanted you to know if you didn't, I know you like the EDT. PS The Silver Mountain Water does smell a bit elf-peeish, doesn't it? But I still find the berry notes on top quite nice. “80% of a great fragrance” is exactly right, and so is the Meteorites reference. I think I commented recently (on another article) that I'd never tried Meteorites but that was just my extremely bad memory. Oh, thank you thank you…I am so glad to hear it. I do love the EdT, but am quite prepared to love the EdP too. Did you actually smell it in a department store? Was wondering if it was still NYC only or in wider distribution. And duh…in my excitement, missed that you said NM. Will try to smell it this weekend. Yes, the NM here in DC (wow, how many abbreviations can I fit in my comments?!?) I was in there doing my usual silly sniffage and just stumbled across it. Boy, it is still going strong, it has a very classic feel to it, but not chypre — just rich and warm. I would love to hear your reaction. When I go back I'm going to spray it on like a real wear (rather than just on my inner elbow, competing with 4 other things) to see whether it's too overpowering. M, thanks again, that is more informative than what I posted on the EdP last month. I wouldn't have called the EdT a chypre, but for all I know, that is its official classification. The notes for the EdT also didn't include patch or oakmoss, but of course that is meaningless. We'll see — even if it is quite different than the EdT, I might well love it. Thanks for the review, R! I liked this perfume instantly. But I fall fast and hard for anything with rose and violet combined, and I am a huge fan of Roucel's creations. Maurice Roucel and I don't see eye to eye: he managed to create the only SL that I truly detest, and it's funny you should mention nail polish because that's what Iris Silver Mist smells like to me – unadulterated nail polish. I'm also not fond of violet as a note so I probably won't like this either, but I'll give it a try, when I'm next in town. Thanks for the review. I just bought a bottle of this. I love the drydown and I love how long this pefume lasts on my skin. At first spritz, it was a bit harsh and I walked away disappointed. An hour later, I came home and my husband asks, what smells so good? It was the Insolence. And it did smell good. So, I went back to Macy's the next day and returned another perfume I had purchased instead of the Insolence and I came home this time wiht the Insolence. I always have to remind myself to give a perfume time to drydown before making a rash decision. So…. 2 thumbs up from me for Insolence. I find the ad very distasteful too…but it is worth trying. It is much more in keeping with the Guerlain line than L'Instant was, although I'm not claiming it to be a future classic. Better a rash decision that ends up with you buying a fragrance you like than a rash decision that ends up with a bottle you hate, right? And it is true, the lasting power is very good. I can take harsh as long as it gets soft after a while (I adore Tubéreuse Criminelle, for instance), but Iris Silver Mist is just awful on my skin from start to finish. I totally agree with Robin, it's much beter than I imagined. I went to the Guerlain boutique on the Champs Elysées this morning and I discovered Insolence. I must say it's a pretty nice aesthetic construction, 'une très belle violette' as we could say in Paris. I tried both edt and extrait, and extrait is even better with irone-cashmeran tones. It can remind the floral woodiness of Amarige. For the ad, I also agree, it's less 'Classique' but it's a way to conquer new customers. 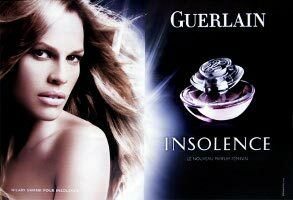 But on the other side, Insolence really sounds to be like a Guerlain. Less ambré, certainly, but woody powdery like some Grands Guerlain. For the fruity persistence, I may have a clue. Certain ionones (violet, iris…) also have a raspberry hue. Undecavertol, green and powerful, have both notes of violet and fruit. But I think only Maurice could tell us. So, to conclude, I would say… go and discover Insolence 'sans préjugés'. Whether you already use Guerlain fragrances or not. I will have to look for the extrait, thanks — to be honest I didn't even know there was one. I had so little optimism for this fragrance that I haven't paid much attention. I hope it will be a way to conquer new customers — anything that is good for Guerlain is good for me, as far as I am concerned. I would like them to be so financially healthy that they can go on reintroducing older fragrances that aren't likely to sell well. Okay, I went over there AGAIN today (they are very tolerant!) I have to say on second sniff I am disappointed. It is a LOVELY orange flower scent, and I think you might like it for that reason. But the parts I thought I smelled yesterday — the buttery/sharp aspect of orris, are just not there. Should be called Arancia Nobile. On a happier note, however, I re-tried the Insolence and liked it more the second time out — it does have a lovely drydown. Hmmmmm….. PS I also tried the “AdP Profumo” — she says it's very old and unisex. I am laughing it is so awful on me! Also PLS try the Prada Homme if you haven't, I think it's the sleeper of the season. Smells like Iris to me at the top, would like your opinion. My, now I'm on the fence. If it is lovely orange blossom, I might like it too, but that is not at all what I expected! Will certainly go look for that & the Prada Homme this weekend. I know people who love the AdP Profumo, but it isn't me at all. Too heavy, or something — actually can't remember exactly why I don't like it. But certainly didn't remember it as a unisex, although it must be because when Iris Nobile was released, they called it the first feminine from AdP. Sampled Insolence at the Saks counter sprayed some on my arm walked away to let it settle smelled nice, Then people started asking me what I was wearing sniffed again it does smell nice. Went back the next day and purchased a bottle. The smell is different but quite lovely. I generally wear jalaine's pat. silk Yosh Heat is deceitful and heavy into patch's and vanillas and Hermes sur nil, Dipyique (sp?) Physillkos and Roucel; Musc Ravageur so this was a slight departure for me as it is somewhat fruity and like you too commented the ad initially turned me off along with the color but give it a try you might be surprisedl it was created by Maurice Roucel. Have been wanting that lotion, and just caved today & bought it. Yum. My local Neiman Marcus doesn't have the Iris Nobile in Eau de Parfum yet, drat! Drat, my NM didn't have the AdP IN. Did snag a sample of Prada Homme though. Pfui!! Well, at least you have the Prada Homme to console you… it is not getting rave reviews, in my opinion because its intended target (men) are finding it too feminine, but I loved it. I am going to buy a bottle from NM, I like to purchase things there occasionally so they won't ban me from the store! At first I thought I was going to like the scent because at first whiff, it smells like a field of violets. However, it started to settle in on my body and the next thing I know the fragrance took on a grape incense scent. It took me back to the Grateful Dead concerts with the scent of grape incense whafting through the air mixed in with some Love's Baby Soft (violet+grape incense+baby powder). Now, that may seem kind of negative and its not intended to. The combination of these scents are interesting and could very well work with another person's body chemistry just fine. Interesting, I wonder if it is the berries that are turning into grape incense? Ah well, sounds like you've saved yourself some money! I have now smelled it and, as expected, hated it. By the time it was sprayed on my skin (and on a 'mouillette') yesterday I'd forgotten it was by Maurice Roucel so I wasn't prejudiced. I found it very unpleasant, but, then, violet is one my least favourite notes. When I got up this morning, I wrinked my nose and went, 'What's that smell?' It was the 'mouillette' sitting on my desk. Definitely not for me. J, sounds like I liked it much more than you did! R, considering how much I disliked it, you wouldn't have to like it an awful lot for you to like it much more than I did, would you? LOL! I've recently revisted “L'Heure Bleue” after a mixed reception. A couple of months ago, it smelled like a particularily pretty–but powdery–floral, with a dash of sandlewood (sort of like my impression of Chanel No.5). However, this evening I've put some on and it smells like an emotionally overwhelming dream; in EDT form, even. How odd–I've heard many exclaim their immense devotion to this peculiar Guerlain, but I never imagined I'd be one of them. It's not so overtly antique as I expected; it feels like an interpretation of “fresh”…before fresh meant “disinfectant”. I could even see myself wearing this for keeps. I've always adored the house (what I wouldn't give to get my nose on an earlier Mitsouko) and I've been saddened to see houses phase out their more classic scents (even ol' Caswell-Massey felt they had to discontinue “Casma”–a roaring twenties staple) over the past ten/twenty years. So, given these things, I'd consider adding “L'Heure Bleue” to my permanent collection. It is funny how you can revisit something you didn't love and suddenly it just “clicks”. Glad you've found a new favorite! Akw–thank you for thinking of me! I must be experiencing some multiple-scent-personality disorder; one moment I'm in bliss with a scent, the next–I can hardly stand to think of it! I've never experienced anything like this before; most of the time, I knew immediately if I adored a scent or disliked it (for wearing). I'm still confused as to whether I can wear “L'huere bleue” or not! I'm going to try it again, then I'll get back to you, if you'd like to make arrangments. I truly appreciate your asking, though! Oh how I love Insolence! What's so beautiful about it is the candy violet opening notes that stay with it throughout the whole ride! It's a beautifully orchestrated fragrance that is indeed representative to Apres-L'Ondee but in a sweeter more modern version. If given the choice I would rather have the Insolence, but Apres-L'Ondee would not be bumped off the vanity top. Like a new version of an old song — it's just as good as the original but the original commands respect. It is very well done, and hope it will sell better than the un-Guerlainish L'Instant, but guessing it won't. So far the reviews at MakeupAlley are rather dismal — only 42% would repurchase, compared to 61% for L'Instant. How that translates into the real world, however, I've no idea. Really, masculine? I didn't strike me that way, but everyone has different tastes! Haven't seen the commercial, will have to see if it is on YouTube yet. I hate to disagree with you all but a work colleague of mine wear this perfume and I find it vile and repulsive. It may be her of course lol!! It irratates my nose and you can smell nothing else in the office when she wears it. Have to say that if you can smell nothing else in the office when she wears it, she must be wearing way too much! I am not a fan of anything strong in the office, especially since most offices these days don't have windows that open — lots of perfume in stale air is not a good thing. your colleague is not wearing too much…its just a very strong smell. one sprayis enugh, but i wear twocos i love it! Other perfumes you need ten and STILL its a hint of a smell……Ilove insolence, great value for money. I just wanted to say that I love this perfume. I know I'm a bit late, as this perfume debuted a while ago, but this is the scent that got me interested in perfumes. I love its duskiness, and yes, even the berries, unsophisticated or not! I'm very late to this discussion of Insolence, but I just bought a bottle yesterday. I had a sample and thought I really liked it. I spritzed it on this morning and liked it. But by the end of the day it seemed so sweet and cloying I thought I'd vomit. I just literally “scrubbed” it off. I'm so disappointed, I hate how many bottles of perfume I have that I end up disliking!! Boo. Anyone want to swap? I've used this ONCE. Hi & welcome! Note that the comment you’re responding to was left in 2008 — sorry but not likely that the person who left it will see your reply. Are you sure you can't return it? A surprising number of stores take opened bottles back. Recently tested the edp version and would rather slide down razor blades than smell it again. Dear God, noooooo! There’s something very bitter in it that burns the back of my throat. I know it’s supposed to be berries and violets, but all I smell are the fumes of Hades. Hallelujah, I managed to pass on my sample, so that there’s no possibility of coming across it by surprise. It’s rare for me to hate something so much. I think the fact that it’s industrial strength makes me hate it even more. Actually, what Insolence reminds me of is the description of Fwoopers from JK Rowling’s Fantastic Beasts and Where to Find Them (purportedly, one of Harry Potter’s school textbooks): brightly colored tropical birds whose incessant singing causes insanity. I found Insolence to be way too candied and sweet. It reminded me of a big early 90’s fragrance, the ones where you have to hold the bottle an arm’s length away and hope only a very fine mist clings to your skin, so you don’t smell overly doused. For me, it did not greatly resemble Apres L’Ondee. Apres seems to rely more on the sweetness of your natural skin to blend with the other notes. Insolence just makes me think of candy. I know Guerlain focuses on their high quality vanilla, but I was hoping for more complexity. Sorry you didn’t care for it! Insolence, I imagined something in-your-face, brazen and moody. It was in fact quite light, flowery and gentle. Very, very nice but not at all what I was expecting. For me it falls into the ‘samey’ category. Lots of perfumes that a the slightest variation on a basic theme. I understand the EdP is more brazen, but have not tried it. I wore Insolence for a few years, and it’s the only perfume that I’ve purchased multiple bottles of. I now find it a little sweet and have moved on to Hermes’ Voyage and Prada’s Infusion d’Iris, but I must say, I have NEVER had so many compliments as when I wore Insolence. I pretty much had people stopping me daily to tell me that I smelled like fruit and candy and that they just wanted to eat me up. And while I love my new perfumes, I am on a seemingly never ending search for a fragrance to match the popularity of Insolence. Oh, then why not just stick with the Insolence? Oh my goodness this perfume is grgeous, and as a dedicated perfume addict, i think this is by far the most economical…it lasts so well! You only need two sprays…i wore it, and a week later i put the sunglasses on that i had worn on the day i wore insolence, and i could smell it on my sunglasses.And no, i dont spray my sunglasses with perfume, or my face! I have to admit that I am not really into this as I find it quite unlike the classic Guerlains and honestly it smells like bubblegum to me and I would rather not smell like bubble gum. That said it has quality and the drydown is definitely Guerlainade probably due to the violet which I do like. It is not surprising though that I am not into it as I really cannot stand fruity fragrances, I am really a chypre person and/or like some florals but I can see myself wearing heavy vintage classics whereas this might feel good in the morning when I am really tired but it really is not me. I am somewhere between stage 2 and 3 of the “Becoming a perfumista” article, and when I got the sample for this today, I thought I’d try it with an open mind. I can see why you say that it’s an “introduction” in a way, as I’ve always found Guerlain scents to be the “Oh my God that lady put on too much!” kind, so I was surprised at this one. It’s still much stronger and perhaps more sophisticated and mature than my “regular” choices, but it has hints of the fruitiness I like. I have truly surprised myself with liking this, as this sort of scent would’ve immediately put me off before. I received a 20 euro gift certificate for my 23rd birthday; it might go towards this….